Balsall Heathens are a 2 piece gypsy pirate acoustic duo from Birmingham, England. They comprise of Jock Blyth, the founding and current guitarist and songwriter of GBH, The Wernt and Sensa Yuma and Sam Springer who has played with Eastfield, Dogshit Sandwich, Screamin Abdabz and many more. Currently Sam plays in The Alcohol Licks, Contempt, The Dollcanoes and Canar du Jour amongst others. They formed in 2007 after Jock had been asked to play at an animal sanctuary benefit concert in Digbeth, Birmingham. He quickly contacted Sam and they got a set of some of their favourite songs together to play acoustically. They still play some of those songs today including “Whisky in the Jar” and the “Devil Went Down to Georgia”. Writing more and more of their own songs all the time, Balsall Heathens are constantly playing gigs when Jock is not on tour with GBH. Balsall Heathens will be playing the Rude Festival in St. Louis, Missouri, the Rebellion Festival in Blackpool as well as touring mainland Europe. 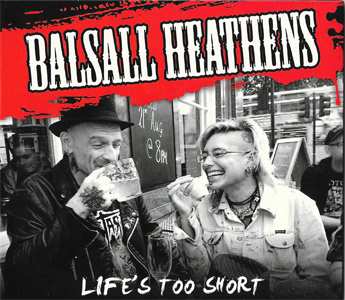 “Life’s Too Short” is the Balsall Heathens debut release and Violated Records are happy and excited to release this. Balsall Heathens are currently in the process of writing new material for future releases in the upcoming year.